From the outside, nothing Vladimir Guerrero Jr. did this season appeared particularly difficult for him. But from his perspective, the challenges were plentiful. "Everything -- defensively, hitting-wise … everything," the game's top prospect said through interpreter and coach Andy Fermin. "I worked hard at everything, and the staff just helped me to get better." Having led the Minors in batting average (.381) and all full-season players in slugging percentage (.636), the Blue Jays phenom was the staff pick for the Top Offensive Player MiLBY Award in 2018. Climbing from Double-A to Triple-A at age 19, Guerrero belted 20 homers and collected 78 RBIs while posting a .438 on-base percentage -- third among full-season players. In October, he reported to the Surprise Saguaros in the Arizona Fall League, where he laced nine hits over his first three games to earn the campaign's first Player of the Week nod. "First of all, I want to thank God and all the people who have supported me through the season," Guerrero said in accepting the MiLBY honor. "It's a result of all of the hard work and all the guys around me who pushed me to work hard every day, and I'm happy to do." His work ethic complemented a seemingly bottomless wellspring of natural talent. New Hampshire hitting coach Hunter Mense joined the Toronto organization ahead of this season and promptly saw evidence of both. "Even before meeting him, talking to every coach I knew and met in the organization… all the things they threw around about him, they were all very lofty," Mense said. "'He's going to be as good as his dad.' 'He's going to do this, do that.' Any time you hear things like that, you go, 'OK, this guy already has a lot to live up to.'" It didn't take long for Mense to get the sense that the third baseman had both the tools and the makeup to be worthy of the expectations. The hitting coach first met Guerrero at a minicamp, where Mense tested his pupils with a series of drills. "Hard stuff, really challenging stuff with machines," Mense said. "I remember the first time I had it set up for him, he was so willing to do it. He wanted to do it because it was so different -- it was a different challenge than he'd ever seen before. "When you sense that players want to go outside their comfort zone and want to do it even though it's a challenge, those are the players you know you're going to see continue to get better. He was always willing to be uncomfortable and to be not very good at it for a bit. That was the first thing I noticed." In terms of tools, Mense goes back to Spring Training and an at-bat against top Blue Jays pitching prospect Nate Pearson. It seemed clear to Mense, who was coaching the Triple-A club while Guerrero was playing with the Double-A squad, that in the unlikely event anybody could catch up to the right-hander's 70-grade heater, the wind would keep the ball in the yard. "I swear it was blowing 20 miles an hour, straight from left-center," Mense said. "The next pitch is a fastball coming in at 100-something, and it came off the bat at 100-plus for sure. He hit it right into the teeth of wind, and it went a long ways, really fast. How quickly it turned and the sound of it, being that close to it and seeing it … It was nothing I'd seen before." That dinger was only the first of many incidents when Guerrero made Mense's jaw drop. In his second April playing under lights, the son of a Hall of Famer batted .388 with 11 extra-base hits over 21 games in chilly Eastern League climes. Although at the time it would have been difficult to imagine that a 19-year-old could do any better than that in his first crack at Double-A ball, as the weather heated up, he started scorching. In his second month, he hit an uncanny .438/.480/.768 with nine home runs. He drove in 53 runs over his first 50 games. After suffering a strained patellar tendon in his left knee, Guerrero missed about a month, worked through a rehab stint in the Rookie-level Gulf Coast League and Class A Advanced Florida State League in time to return to New Hampshire on July 19 and picked up where he left off. He smacked three homers and a double over his first seven games back in the EL, after which he got the bump to Buffalo. "When I got hurt and came back, I knew I missed a little time," he said. "But I just had to work hard and work through it to be able to [compete at an elite level] again. I just come [to wherever I play] and try to improve every aspect of my game and try to work every day to get better at every part of the game." "I think whether he's hitting .100 or .400, if he misses any sort of time, it kills him," Mense said. "It speaks to how much he genuinely loves to play the game," he said. "For him, above all else, it's his desire and motivation. If you take that away, it hurts him regardless." In fact, when Guerrero was healthy, he hated to take days of rest -- even for the morning games many teams play on "school days" for crowds of elementary school children early in the season. 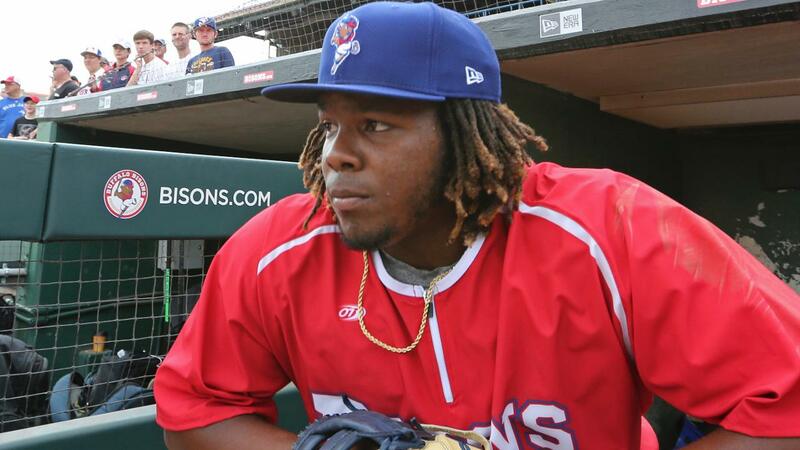 On one such day, Fisher Cats manager John Schneider had the star scheduled to sit. Mense was throwing batting practice at an hour when players are typically sleeping off the previous night's game. "Usually, guys who are playing in those games come [for batting practice], and guys who aren't playing don't come down. Vladdy wasn't in the lineup, but he was in there hitting," Mense remembered. "Somebody said, 'Hey, what are you doing down here?' He said, 'I'm hitting.' He didn't realize he wasn't in the game. I'll never forget the look on his face when he found out. I think he went back into the locker room, too and told Schneids he doesn't like sitting -- he wants to play." With that kind of drive, it shouldn't have been a surprise that he handled his jump to Triple-A so deftly; anybody who thought finishing the year at the Minors' highest level was going to put a significant damper on Guerrero's final stats was mistaken. "I went up there and things just went well, like they had in Double-A, and I just tried to do my job," he said. He hit .336/.414/.564 with 13 extra-base hits over 30 International League games. There were stretches when he was hands-down the circuit's most dangerous hitter; from Aug. 8-11, he went yard in four straight games while going 8-for-16 with 21 total bases. "He's just ready to hit every time," Bisons hitting coach Corey Hart told MiLB.com during the tear. "He's able to go up there and look for a fastball and be ready to hit a fastball, and if they throw something up in the zone other than a fastball that he can hit, he does." That means for a pitcher, there's no magic trick to get him out, no weakness to exploit, so a hurler is better off simply attacking the guy with his best stuff. But, unfortunately for that pitcher, Guerrero feeds off being challenged directly. The Fisher Cats hitting coach won't forget seeing that work in the young slugger's favor in one instance toward the end of July. "One of the last games he played with us, we were in Reading and he was 0-for-2 in the game, and he had chased quite a bit. He was DHing and he just didn't look the same. He sat next to Andy and I on the bench, and Andy said, 'Hey, you don't look yourself.' He somewhat challenged him, 'You've got to get back into this game,'" Mense explained. "His next at-bat, they shifted on him. They had three guys on the left side of the infield. You could see him step out, kind of grin and say, 'Oh, they've put the shift on me,' and he hit a missile through the right side. "When you put a challenge in front of him, it's like, 'There's something I can compete with now.' I really think that's why you see him get better at every level; there's a different challenge for him to take on. For him, it would almost be better if we faced an ace every day." Of course, when Guerrero gets that kind of challenge -- going up against the best of the best on an everyday basis -- he'll have reached the big leagues. If the way he responded to Double-A and Triple-A is any indication, it's going to be a very special rookie year. A catcher until this year, Angels prospect Taylor Ward moved to third base and unlocked more offensive potential than most would have thought possible. The 2015 first-rounder entered the season a career .272 hitter but busted out to bat .349 across the Minors' two highest levels. That average not only led the Los Angeles system but was the second highest among full-season Minor Leaguers. He also was second in that group with a .446 on-base percentage. The Fresno State product was on fire from the start. After going 3-for-5 with two RBIs and a run scored for Double-A Mobile on Opening Day, he racked up multiple hits in each of his next four games and went 14-for-26 (.538) over his first seven games. He was finally held hitless April 13 (although he did walk twice and score a pair of runs), but the very next day reached base four times and swatted his first home run. That long ball already marked his fourth extra-base hit of the year, and he went on to set career highs in homers (14), doubles (26) and RBIs (60). "He doesn't overthink things," BayBears manager Lou Marson told MiLB.com during the season. "He doesn't put too much pressure on himself and continues to put together quality at-bats. He just worries about going up there and finding a good pitch and barreling it and keeping it simple." Moving up to Triple-A for the first time, he continued to mash. A little more than a month after his promotion, he put together a four-game stretch in which he was one of the toughest outs in all of baseball. From July 2-5, he tallied 14 total bases for Salt Lake, going 13-for-17 (.767) with two walks six RBIs and four runs scored. All told, he belted eight dingers and 18 two-baggers over 60 games with the Bees. But what Ward did at the plate was only part of his breakout. He'd flashed speed in other seasons, but this year he more than doubled his previous career high with 18 steals in the Minors. "Early on in [Rookie-level] Orem [in 2015], I stole a couple, but I think they were probably hit-and-runs that got messed up. Those weren't legit," Ward told MiLB.com toward the end of July. "I realized in Spring Training with my speed and fresh legs that I could probably steal some, and I set a goal for 20 stolen bases." He reached that goal, although not until after he reached the Major Leagues on Aug. 14.